Consumers AND critics love the FJ Cruiser. It's claimed titles ranging from "Best Overall Value of the Year" to "Lowest Ownership Costs" from IntelliChoice, and it's received a near perfect 4.9 out of 5 consumer rating on Edmunds.com, as well as an impressive 9.4 out of 10 rating on Kelley Blue Book's KBB.com. Continue reading our 2014 Toyota FJ Cruiser review for more information about this award-winning SUV. There are many midsize utility vehicles to choose from, but for the adventurous type FJ Cruiser offers a perfect combination of comfort, unique outdoorsy style and rugged off-road capability. It's specifically equipped to provide go-anywhere utility with a hardy boxed steel ladder-braced frame, hydraulically assisted rack-and-pinion steering and specially tuned suspension; a high ground clearance also makes it easy to scale rocks or trek through watery paths. Along with its under-the-hood features, FJ Cruiser offers design elements that help make life more convenient for those traveling off the beaten track. This includes features like a swing-up glass hatch that opens independently from the rear door, as well as useful side doors that open up at a wide 90 degree angle. If you're interested in purchasing the 2014 Toyota FJ Cruiser in Evansville, Indiana, visit Kenny Kent Toyota to browse inventory and learn about current lease and finance options. 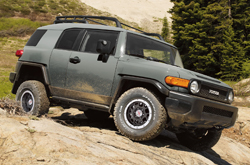 Once you've had a chance to take it for a spin, you'll understand why The Car Connection's 2014 FJ Cruiser review calls it an "all-star" for off-roaders. With a capable 260-horepower V-6 and amenities such as Bluetooth hands-free phone, an iPod/USB interface, water-resistant upholstery and heavy-duty vinyl flooring, FJ Cruiser combines off-road ruggedness and high-tech convenience like few other SUVs. Stop by during dealership business hours for a test drive or schedule an appointment in advance by filling out our online contact form. The 2014 Toyota FJ Cruiser is on sale in Evansville right now at 5600 Division St., just off North Burkhardt Road. Evansville is located near the tri-state area, so we're not only happy to serve residents in Indiana, but also customers from Illinois and Kentucky. We challenge you to compare the latest FJ Cruiser model to class rivals like the 2014 Nissan Xterra, Dodge Durango, Jeep Wrangler, Chevrolet Tahoe and the Ford Edge. That's how confident we are that it's perfectly fitted for you. The FJ Cruiser's progressive cabin features and low MSRP are just a few of the winning qualities that shoppers will love. Compare its price to the aforementioned vehicles and you'll see that it's a fantastic value, which is one of the main reasons why so many Evansville drivers select it. 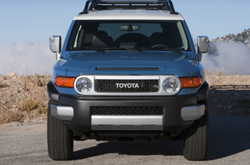 For more information about what it offers, check out the FJ Cruiser's quick-facts list under this text. Does the FJ Cruiser have what you want out of a vehicle? Check out Kenny Kent Toyota's overview above, as well as other 2014 Toyota reviews to find the ideal model for your needs and budget. We are a top-rated Toyota dealership in Evansville, and it's our job to provide you with reviews transcribed by some of the most accomplished automotive writers in the industry. To make wise decisions when it comes to your next Toyota purchase, don't guess! Each overview is crammed with facts, including info about vehicle features, in an easy-to-understand page layout. 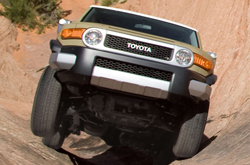 Please visit our Toyota review and compare index page if you feel the FJ Cruiser is not appropriate for you; there you&ll learn about Kenny Kent Toyota's entire lineup.